According to Indian Mythology, when Gods and Rakshasas - the demons - churned the oceans using the mountain Meru as churner, a golden pot sprang out containing the Elixir of Life.That was called the "Amrut" The great founders of this Indian distillery aptly named it Amrut Distilleries. Amrut Single Malt Whisky is made from selected Indian barley grown at the feet of the Himalayas, nurtured by the waters flowing there and cultivated by old and traditional agricultural practices. It is carefully mashed and distilled in small batches to preserve the natural aroma and matured in oak barrels in a unique tropical condition,at an altitude of 3,000 feet above sea level at Bangalore, the garden city of India. 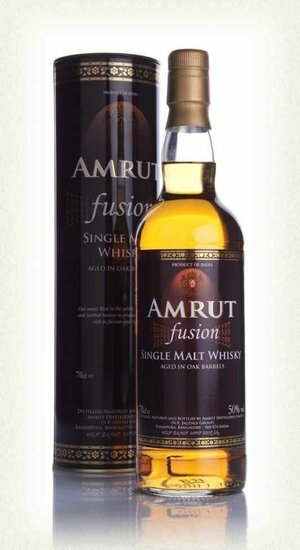 Amrut Fusion is created from a mix of 75% unpeated Indian barley and 25% peated Scottish barley. These are separately distilled and aged for four years, then 'fused' together for a furnher three months. Massively aromatic, with nutty, peaty notes and a touch of sweetness. On the palate, a heavily peated entry gives way to dried fruit and marzipan and the finish is filled with brown spice, cedar and smoked almonds. No wonder whiskey writer Jim Murray named it the third best whiskey in the world.